You know when you’re the aural company of something genuinely important when you catch yourself staring off into the middle distance as every thought is subsumed by the music, the lyrics, the very air of what’s emanating from the speakers. And so it is with this wonderfully realised recording of Molly Drake’s wistful legacy. Evocative and respectful, but never slavishly reverential, Becky and Rachel Unthank offer their interpretation of the songs Molly’s grand-daughter released in 2013 from informal tapes made as she entertained house guests. 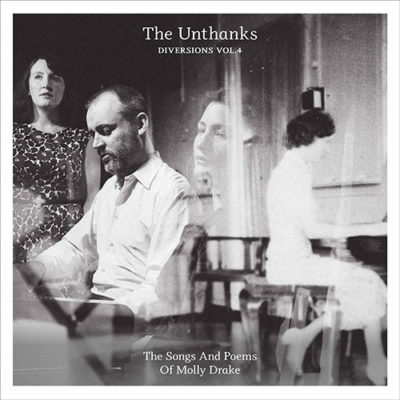 Molly’s daughter the actress Gabrielle Drake (sister of revered singer songwriter Nick) worked on the album with the Unthanks, remembering what she could of how her mother had sung some of the unrecorded lyrics and reading poems aloud for the group to use as reference. In the event so taken were the Unthanks by Gabrielle’s readings, rather than turn them into songs as intended they composed music for her spoken words. It all makes for a hugely affecting listening experience. Molly’s words skillfully harness emotions, examine feelings and issue practical suggestions, yet these were personal pieces she chose to share with close friends; they weren’t conceived for public consumption. It’s tempting, but ultimately pointless to wonder how things might have turned out had her son also been able to retain that intimacy for his own material. The songs are delivered in Becky and Rachel’s native Northumberland accents, at once setting them apart from Gabrielle’s readings, but also emphasising the interpretive nature of the recording – it’s the sound of the material being taken to another place, a public forum and making their presence felt in their own right irrespective of their connection to the Drake family with all the baggage that might entail. In their simple musical settings – piano, guitar, bass and some gentle reeds – songs such as Set Me Free offer tellingly innocent musings on the bigger questions of life, love and death, but perhaps the material is at its most personal and revealing when viewed as maternal advice. The haunting What Can A Song Do For You? sets the tone fair well and there are even deeper truths to perceive in Never Pine For the Old Love and Dream Your Dreams, while The Road to the Stars adds sparkle to the tone. Elsewhere, beauty and wonder in nature abound across the verses of Little Weaver Bird and Soft Shelled Crabs. Make no mistake, this and the eight-track Extras appendage available on The Unthanks’ website, is really saying something.